A wide range of ready made curtains in sizes from 120cms to 275cms drop are available, mostly with matching pelmets and tiebacks, as well as a selection with matching duvet covers and cushion covers. Made to measure curtains are available from the Ashley Wilde and Hardy Fabrics ranges, and material by the metre is both held in stock and available to order from many well-known fabric producers. PVC coated fabrics and table vinyl coverings are a speciality, as are net curtains in drops from 18” to 90”. Curtain Rails are held on the premises in sizes up to 5mts long (over 16 feet), with the option of manual cording or even electric operation. 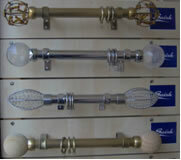 Modern and traditional curtain poles in wood and metal are also available. Vertical blinds, Venetian blinds, Roman blinds, Roller blinds, Pleated blinds, Conservatory blinds, Velux blinds. Wood and bamboo blinds. With the extensive range and variety there are too many options to catalogue here, however the latest technology in ‘Iso-blinds’ cope with the problems of Tilt’n’turn windows and are a revolutionary product well worth a second look. 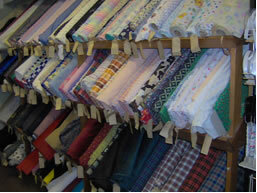 We also stock a wide range of textiles and sewing accessories. Whatever your requirements contact or visit us and we will be able to advise you.